the man in the nhl’s first mask: not clint benedict? 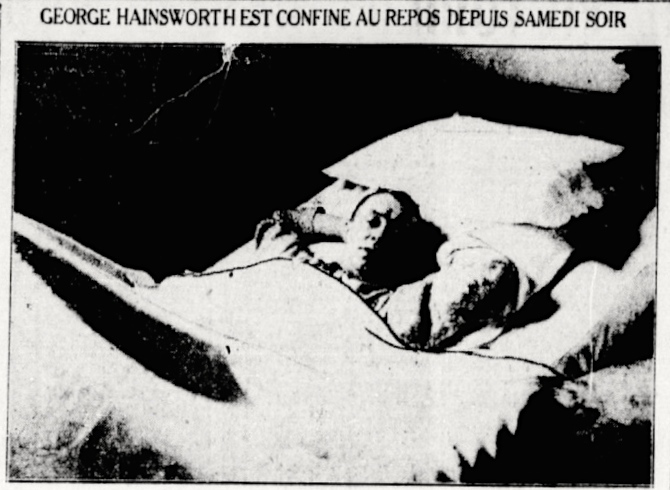 Head Case: George Hainsworth, battered Canadiens goaltender, rests in his hospital bed after his friendly fire incident in January of 1929. It’s settled in, now, rooted deep enough that feels like permanent truth: whereas Jacques Plante in 1959 is the acknowledged trailblazer when it comes to goaltenders wearing a mask in the NHL — the man who changed everything in that department — Clint Benedict did, of course, get there before him, donning a mask of his own in February of 1930. 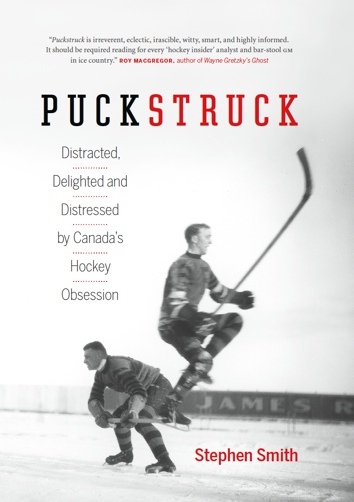 That’s how it’s rendered in the hockey literature — in the new edition, for example, of Saving Face (2015), a handsome history of hockey masks Jim Hynes and Gary Smith, or in the goalie-focussed edition that The Hockey News put out in December. But maybe was Benedict not the first goaltender to mask himself in an NHL game? Could a damaged Montreal rival of his have beaten him to it by almost a year, viz. George Hainsworth of the Canadiens? If so, this would be news. But is it true? 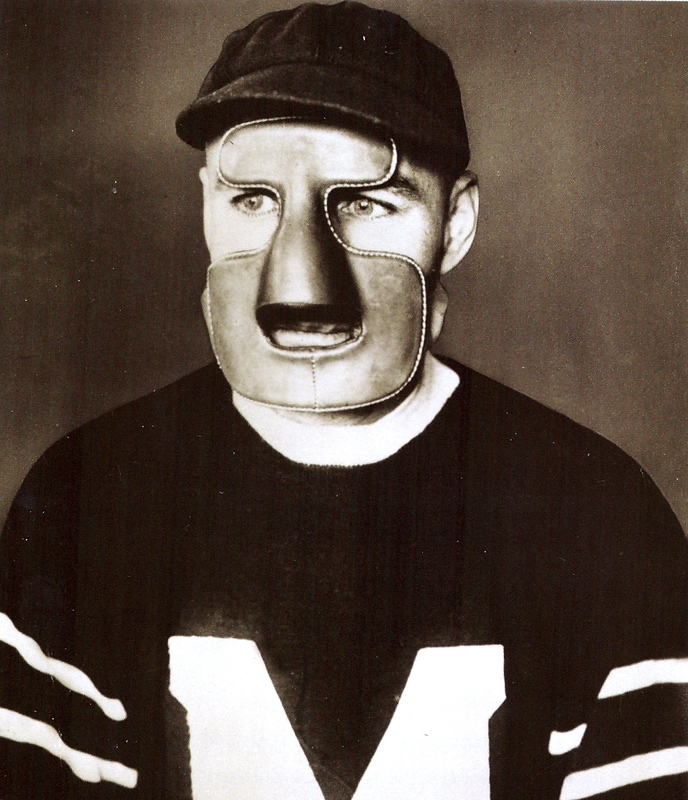 In 1930, Clint Benedict suffered head wounds in successive games — followed by a 15-game absence — before returning to the ice with mask in place to patrol the net for the Montreal Maroons. First up, on January 4, Boston’s Dit Clapper broke in on a third period rush and his shot knocked Benedict out cold. Revived, he went to the dressing room to collect himself. Ten minutes later, he was back to finish the game. Three nights later, Maroons and Canadiens, it was Howie Morenz who brought the puck towards Benedict’s net. His first-period shot flew high and hit the goaltender, as Horace Lavigne of La Patrie wrote it, with incredible violence. Lavigne thought the goaltender jumped to stop the puck — just before he dropped “like a lead weight.” There was plenty of blood and this time when Benedict departed the ice, he went to the hospital to be tended for a broken nose and a cut that needed seven stitches to close. The Maroons did have a second goaltender, Flat Walsh, but he was himself indisposed that night — at home, suffering under a fever of 102. Still, when the call from the Forum came, he got himself up, into a taxi, and over to the rink — where he arrived wearing a coat over his pyjamas. After a half-hour’s hiatus, the game resumed with Walsh in the Montreal net. Benedict, for his part, left the hospital as soon as he was able, heading back to the Forum to catch the end of the Maroons’ 2-1 win. Clint Benedict in his mask, 1930. Benedict stuck with the mask for four more games after that — or three-and-a-third. It’s often written that he discarded the mask after a game or two, but as Eric Zweig has written, that’s not so — what happened was that, five games after he returned, Benedict discarded hockey. Injured again in a game against Ottawa — someone fell on him, or cracked him on the mask, or both — he gave way again to Flat Walsh, who played the Maroons’ final four regular-season games as well as the team’s first-round playoff series, which was lost in four games to Boston. George Hainsworth was the Canadiens goaltender on the night, January 7, 1930, when Morenz’s shot sent Benedict to the hospital. He might have winced, or shuddered: possibly a stab of phantom pain in his nose made his eyes water. Hainsworth was 36, just a year younger than his rival down at the other end. But while the battered Maroons goaltender was nearing the end of his distinguished NHL career, Hainsworth was just getting going. Leo Dandurand had signed him in the summer of 1926 from the WHL Saskatoon Sheiks and, after a brief tussle with the Toronto St. Pats, who believed they owned his rights, Hainsworth took to the Montreal net to succeed the late lamented Georges Vézina. He proved a worthy successor, playing in every Canadiens game for the next three seasons, most of which were victories. In 132 regular-season games in those first three years, he had 49 shutouts. After Vézina’s death at the end of March of 1926, the NHL inaugurated a trophy in his name, for the league’s best goaltender, and Hainsworth won it for the first three years that it was awarded. But, for all his successes, were Canadiens loyalists slow to embrace him? Did they possibly not love him as much as they had loved Vézina? 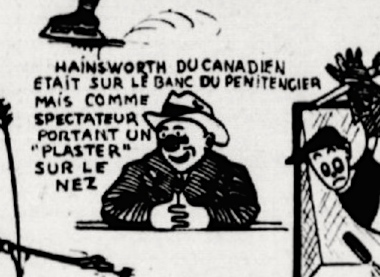 That’s what Ron McAllister suggests in the Hainsworth chapter he wrote in his popular compendium of profiles, Hockey Heroes (1949); it wasn’t until early in 1929 that the Montreal faithful finally learned to love Hainsworth. Which brings us, at last, to the (possible) case of Hainsworth’s pre-Benedict mask. The night Montreal faithful learned to embrace their new(ish) goaltender was a Thursday, January 24, 1929, when the Canadiens hosted the Toronto Maple Leafs at the Forum. The game ended in a 1-1, with Montreal winger Aurèle Joliat scoring the home team’s goal. But before he fired that shot, Joliat unloosed another: in the warm-up he hit Hainsworth full in the face — an accident, of course, as much as it might have seemed like a rehearsal, or demonstration for his linemate Morenz showing how to go about it in a year’s time. Hainsworth bled and, as Le Canada reported, bled. While Canadiens’ physician Dr. John Corrigan did his best to stanch the flow, he found that the nose was broken. While the doctor dressed the wound, the team’s management saw to it that an announcement went out over Forum loudspeakers: would Hughie McCormick please present himself, if he happened to be in the house? McCormick was a practice goalie for the Canadiens, a former minor-league guardian of nets, whose story is worth a telling on another day. He didn’t answer the Forum call, though. If Hainsworth was thinking of taking the night off to recover from Joliat’s friendly fire, he now changed his mind. “Courageous,” Le Canada wrote, “Hainsworth insisted on resuming his place. Dr. Corrigan gave him a preliminary dressing and he played the entire game. If not for him, said the Gazette, who knows how Montreal would have withstood Toronto’s onslaught. “His sterling work in the middle session probably saved the Flying Frenchmen from defeat, for in the middle session the Leafs swarmed all over the local team.” One eye was swollen nearly shut; after the game, he went by ambulance to Notre Dame Hospital. Still, Dr. Corrigan told reporters that he was confident that the goaltender would be ready to play two nights hence, when the Canadiens went to play in Ottawa. Can we pause here for a moment to consider the season that Hainsworth was having at this point? This was the year he recorded 22 shutouts in 44 regular-season games. Before Joliat broke his face for him, Hainsworth had slammed the proverbial door in 11 of 25 games, including four of the five leading up to the Toronto game. In case Hainsworth couldn’t play in Ottawa, the Canadiens got permission from the NHL to use Hughie McCormick. There was also talk of calling in a young goaltender who’d practiced with the team in the pre-season, Alex Bolduc. At the hospital, X-ray confirmed Dr. Corrigan’s diagnosis: Hainsworth’s nose was fractured. Canadiens coach Cecil Hart was, all the same, holding out hope that his goaltender would be on the ice in Ottawa. At some point on Friday he did check himself out. He felt well enough, it seems, to head for a rink — an artist for La Patrie caught him at the Mont-Royal Arena watching from the penalty bench as a local senior team, Montreal St. Francois Xavier, went through its practice paces. The Canadiens trained down to New York next for a pair of games at Madison Square Garden to start the new week. The first of these, Monday night, was a make-up game against the Rangers, defending Stanley Cup champions. The two teams had originally been scheduled to meet on January 8, but promoter and Rangers’ founder Tex Rickard had died, and the game was postponed to honour him. … crashed the disk past Hainsworth, only to have the shot disallowed as the crowd booed. Bourgault was all alone at the rival net, and though the spectators thought the goal had been made the ruling was that it had hit the top bar and did not fall into the net. At the finish it remained Canadiens 1, Rangers 0. This January 28 game is the one in which Hainsworth may have worn some kind of protective mask to guard his wounded nose — which, again, would ante-date Clint Benedict’s famous face-guard by more than a year. Unless there was no Hainsworth mask: the evidence I’ve come across comes down to a single reference in a single newspaper account. Two New York papers go into more detail — it’s just that the details don’t agree. He was hurt in practice, but the goalie was undaunted by the handicap, because he stood up in the face of the first Ranger assaults with real courage and stopped several hard shots that the Ranger forward line carried against him. Not a spectator dared leave until the final whistle. One goal really decided it, but there was much ado before and after it. Once the playing surface was swept practically clean of Rangers. Frank Boucher tied the score, yet didn’t, in one man’s opinion. Excitable Frenchmen hugged and kissed on the ice. The crowd did everything but mob the referees. And Bill Cook drew his third damaging major penalty. Quite a game, by and large, once everybody got their mad up. Howie Morenz reported with an ailing ankle and Goalie George Hainsworth wore from ear to ear a rubber protector across the bridge of a nose broken in practice at Montreal last week. But Morenz ran into a blue pocket with a tightening draw-string every time he attempted to advance and Hainsworth’s nose was in danger only once. It was when rubber met rubber. The goalie was hit in the face by a high shot from Bill Cook’s weapon of wood. He put up both hands as if blinded. Both Cook brothers put their arms around him. But his mask had literally saved his face. So there it is. A rubber protector. His mask. More than merely a passing reference, Burr’s is a very specific description And yet he remains all alone in his specificity. Assuming he wasn’t the only one to spy this mask of Hainsworth’s, could he really have been the only man on the reporting job to deem it worth a mention? Or (as seems more likely) did he mistake Hainsworth’s bandaging for some kind of custom appliance? It’s worth noting that he was in error regarding Montreal’s other “cripple:” the injury that had kept Morenz out of the line-up in early 1929 was to a knee, not an ankle. In the case of Hainsworth’s purported protection, Burr was far away from the ice, high up in the press box, with just his eyes to see by — something he alludes to later on his report, as it happens. Too bad, though: he wasn’t interested, in his sleuthing, in what was going on in the front of Hainsworth’s face so much as he wanted to get the goods behind New York’s phantom goal. A moment later another American attack swarmed in on Hainsworth and in the mêlée that ensued the Canadien goalie was cracked on his injured nose, but he merely shook his head and resumed play presently. That’s from Grover Theis, back in the building for the Times — he didn’t feel the need, on this night, to mention what how Hainsworth was or wasn’t fortified. As for Burr, his account of the game mentions Hainsworth only fleetingly, with nothing on the nose or what it might have been wearing. The reporter did, in a sidebar, have something more to add on the goal the Rangers missed out on the previous night. Human error was to blame, apparently — another question of eyesight. Behind the Montreal net, the goal light had failed to flash. The goal judge, so rumor runs, was busy trying to blink a tiny particle of steel from his eye that the screen in front of him had shed down upon him. 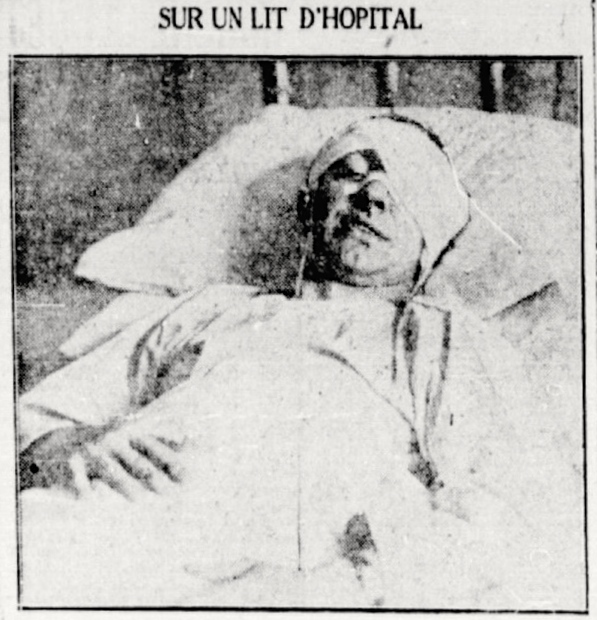 It is claimed he didn’t even see Boucher’s shot, as he was temporarily blinded. By the time the Canadiens played their next game, a 2-2 tie at the Forum against the Detroit Cougars, Hainsworth had either dispensed with his bandaging or the scribes had tired of describing it: neither the hometown Gazette nor The Detroit Free Press mention anything regarding Hainsworth’s packaging in their reports on the game. Same story when the Canadiens returned to New York in mid-February to see the Rangers. If Hainsworth was masked, sporting ceremonial headdress, or tending the net in street shoes, neither Grover Theis nor Harold Burr thought it worth a mention. As Montreal’s season carried on, Hainsworth continued to stop pucks even more efficiently than he’d done before his nose was smashed: in the 20 games after Joliat’s shot struck him down, he claimed 11 shutouts. That got him to 22 on the season — still a record in the NHL — and won him his third Vézina Trophy. None of which translated into playoff success that year: against Boston in the opening round, Montreal went out in three games. The Canadiens did win the Stanley Cup the following year and the year after that, too. Those were George Hainsworth’s first and only Cups, though he did carry on, maskless, in the league for another seven seasons after that. So was he the first NHL goaltender to put on a mask? Beguiling as Harold Burr’s report is, unless stronger evidence comes along, I tend to think that Hainsworth’s protecting device, this alleged rubber mask of his, was in fact the plaster seen and reported by others. Either way, by the time Clint Benedict donned his (much better documented) mask in February of 1930, Hainsworth was back in a hospital bed in Montreal. Once again he’d left the Forum directly following a game — a 9-2 win over the Americans, in this case — though the institution in question this time was Sainte-Jeanne d’Arc and the trouble … well, The Gazette said it was flu while La Patrie (who of course dropped by to take a photograph) reported inflammation of the kidney. Whatever it was, he didn’t rise as quickly as he had a year earlier. He missed two games, with Mickey Murray and Roy Worters providing emergency relief, before returning at the beginning of March, barefaced, to continue the campaign. Abed Again: Hainsworth in hospital, for flu or kidney, in February of 1930. Hey Smith, Jim and Laurie from the new Orange Province (can you believe it), I heard you today on the NHL Network with Kouleas – hit the big time, eh? Nice job, great interview.